A special corpus was announced in the Union budget of 2010-2011 to finance research and innovation in clean energy. The National Clean Energy Fund (NCEF) was received with much applause. Research in clean energy is the need of the hour, said officials and policy makers. The fund was raised on the basis of the “polluter pays” principle, wherein a clean tax of Rs 50 was levied on each tonne of coal mined or imported. Three years later, it turns out NCEF was all pomp and no show. With Rs 8,200 crore in its kitty, NCEF is ill-utilised and directionless. The non-lapsable fund, under the Ministry of Finance (MoF), is being used for everything but research and innovation. Anybody can apply for NCEF but through a government department that acts as a sponsor. Ministries are interpreting NCEF guidelines in their own way to claim a share of the pie. MoF has approved projects worth 45 per cent of the accumulated Rs 8,200 crore (for more details, see table). MoF says it is helpless. “What can we do? Most proposals we have received so far did not focus on research and innovation,” says an MoF official who does not wish to be named. “It is disappointing but we cannot keep sitting on the money,” the official adds. A Planning Commission member, who is part of NCEF funds disbursal, explains why ministries shy away from research projects. Research component involves risk-taking which many ministries fear, says the official requesting anonymity. “We need to change this mindset and ensure that the fund is not used for political gains,” he says. Panda concurs. 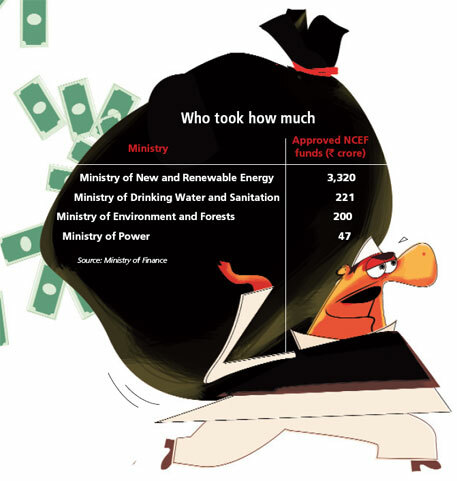 “NCEF is ill-utilised either because ministries lack interest or they do not have capacity to formulate good research proposals.” What more can be expected when the inter-ministerial group (IMG) set up to appraise projects seeking NCEF is itself confused. In the first IMG meeting, finance secretary Sunil Mitra observed: “The fund cannot be treated as an adjunct to the general budget, wherefrom shortfalls in meeting budgetary requirements of already approved plan or schemes can be met.” During the same meeting, the then secretary of the Ministry of New and Renewable Energy (MNRE), Deepak Gupta, said as per the briefing by higher authorities, NCEF would fund shortfalls in budgetary allocation for JNNSM. There is nothing wrong in deploying existing technology as long as it is clean, says MNRE joint secretary Tarun Kapoor. “As I understand, NCEF was created to promote clean energy. If we wait for research and innovation to happen, promotion or deployment, which is crucial, might get delayed. Large-scale deployment helps bring down the price of technology,” says Kapoor. MNRE does not have the money needed to meet its ambitious targets, he adds. The ministry had asked for Rs 40,000 crore in the 12th Five Year Plan but was approved Rs 19,000 crore. “Of this, we have received only Rs 2,600 crore. Going by the previous trend, we may not even touch Rs 7,000 crore by the end of the Plan,” says Kapoor. He was quick to add that MNRE has not taken all of the NCEF fund; a good part is still left to be invested in research and innovation. Figures show that MNRE has received 87 per cent of the total approved fund. Receiving NCEF fund has been reduced to a child’s play, courtesy the NCEF guidelines that have been designed with little clarity and many loopholes. While some eligibility criteria permit any “green” project to pass through, others restrict even a good research proposal from accessing NCEF. 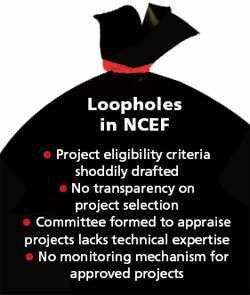 As per the guidelines, the amount sought from NCEF should not exceed 40 per cent of the project cost. This 40 per cent figure is arbitrary, says Panda. Many projects with innovative ideas, research and technology in the field of clean energy may require higher investment. The 40 per cent cap may endanger viability of a good project, he adds. Meena Agarwal, officer on special duty (procurement), MoF, says the cut off was decided because the ministry wanted the other side to participate and have a sense of ownership over the project. But IMG itself overlooked this criterion and approved projects that asked for more than 40 per cent or even 100 per cent of the project cost. Details accessed by CBGA through a right-to-information application show in 2011 IMG gave 100 per cent funds to an MNRE pilot project under which 5,500 portable and fixed cook stoves were distributed in rural areas. Another MNRE project of installing solar thermal systems in 16 states received 65 per cent of funds. When asked to clarify, a senior MoF officer said, “These were special cases.” There is, however, no mention of any criterion for special cases in NCEF guidelines. The eligibility criteria too have been shoddily drafted. As per the criteria, organisations seeking NCEF funds will have to put in a minimal financial incentive of 40 per cent of the project cost, and projects funded by any other government arm or those that have received foreign grant will not be given NCEF funds. The clauses, say researchers, may discourage research scholars, institutes and private players who cannot afford 40 per cent of the project cost. And if a project proponent manages to get funds from outside, it becomes ineligible for NCEF. This overlooks the aspect of public-private partnership to pursue research and innovation, they add. Analysts say if MoF is not receiving good research proposals, then there is a need to build capacity of ministries by increasing in-house technical expertise and access to external resources. Mapping status of clean energy research is also important to find gaps, add the analysts. For this, regular consultation with stakeholders, including research institutions, is needed. A comprehensive plan is required to share knowledge and build capacity, says Pandey. She says there should be a mechanism for prioritisation in project selection like pilot projects and projects in off-grid areas because of their larger potential. Analysts say India can learn from funding models operating in other countries. One of them is Thailand’s Energy Conservation Promotion Fund (ENCON) for promoting renewable energy and energy efficiency. The fund, running since 1992, is raised by levying tax on petroleum products. ENCON monitors the projects it has funded to know their effectiveness and annually reviews its strategy—something which NCEF does not do. Another example is of Malaysia Electricity Supply Industry Trust Account, meant to supply electricity in a clean and efficient manner in Malaysia. The fund is fed through electricity generating companies which contribute one per cent of their electricity sale. Projects seeking this fund are evaluated and monitored through a technical committee. The fund has a website for the public. MoF says it realises that monitoring is required and priority has to be given to research and innovation. “We are reworking the guidelines,” says Agarwal. NCEF had been created out of coal cess. Mining activities lead to land degradation and increase in hazardous heavy metal bioaccumulation in the ecosystem.One can see whole lot of research been done by Dhanbad school of mines on this subject. Clean energy just does not mean renewable energy . Clean energy need to be seen to facilitate clean mining activities/ other energy exploration system with sound environmental remediation measures in place. We should not criticize the fact that some part of NCEF is been taken for bioremediation research for cleaning up the contaminated soil and environment. I think this is quite thought ful decision to allocate some fund from NCEF in clean technologies research for environment remediation.